Recent discovery of a nonclassical rotational inertia (NCRI) in solid 4He below 0.2 K by Kim and Chan has revived great interest in the problem of supersolidity and initiated intensive study on the properties of solid 4He. A direct proof that the onset of NCRI corresponds to the supersolid transition would be the observation of a corresponding drop of the entropy of solid 4He below the transition temperature. We have measured the melting pressure of ultrapure 4He in the temperature range from 0.01 to 0.45 K with several single crystals grown at different pressures and with the accuracy of 0.5 μbar. In addition, supplementary measurements of the pressure in liquid 4He at constant volume have been performed, which allowed us to eliminate the contribution of the temperature-dependent properties of the pressure gauge from the measured melting pressure data. With the correction to the temperature-dependent sensitivity of the pressure gauge, the variation of the melting pressure of 4He below 320 mK obeys the pure T 4 law due to phonons with the accuracy of 0.5 μbar, and no sign of the transition is seen (Todoshchenko et al. in JETP Lett. 85:454, 2007). This sets the upper limit of ∼5⋅10−8 R for a possible excess entropy in high-quality 4He crystals below 320 mK. 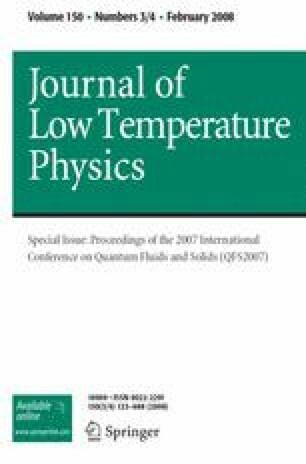 At higher temperatures the contribution from rotons in the superfluid 4He has been observed. The thermal expansion coefficient of the superfluid 4He has been measured in the range from 0.01 to 0.7 K with the accuracy of ∼10−7 1/K, or by two orders of magnitude better than in previous measurements. The roton contributions to the melting pressure and to the pressure in liquid at a constant volume are consistent and yield the value of 6.8 K for the roton gap, which is very close to the values obtained with other methods. As no contribution due to weakly interacting vacancies to the melting pressure of 4He has been observed, the lower limit of about 5.5 K for their activation energy can be set.